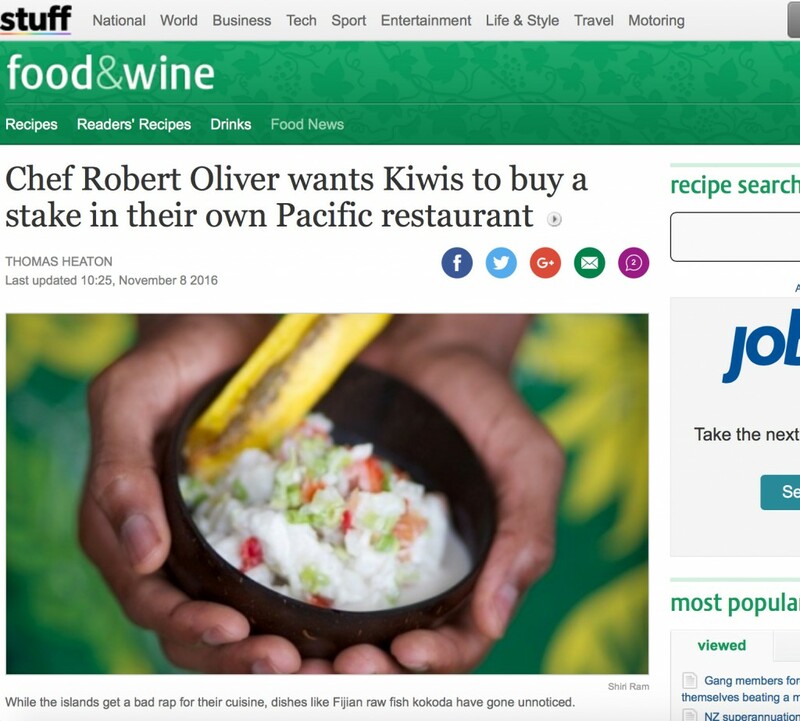 World-renowned Kiwi chef Robert Oliver is hoping to change negative stereotypes of Pacific cuisine, showing it’s more than just fatty pork and taro. Winner of the best cookbook in the world and ex-My Kitchen Rules New Zealand judge, Oliver has taken Pacific cuisine across the world, setting up restaurants across the United States. But the proud Kiwi wants to highlight the cuisine at home in Aoteroa. He’s aiming to open one Kai Pasifika restaurant in Auckland this year, with a second on the cards by 2019. The plan is to boost trade with the Pacific Islands and train chefs in local cuisine. Members of the public are being invited to make their own contribution through Pledgeme with an incentive of having a stake in the restaurant. Oliver said he wanted people to take ownership of Pacific cuisine, and the restaurant, rather than seeking private investment. Dishes on the menu include salmon poke, fish salad; Fijian-style kokoda, a coconut milk marinated fish dish; and pork belly with koko Samoa, a chocolate sauce. New Zealanders can invest from wherever they are. “[They] can come to Auckland and say ‘I’m going to my restaurant’,” Oliver said. The group are also open to looking at expanding into Wellington and other major centres. Up to 50 per cent of the company is up for grabs, with a minimum investment of $500 at $1 a share. Their target for investment is $450,000, with a cap at $600,000. Over $150,000 has been pledged so far, with the campaign culminating at the end of November. Oliver said he viewed New Zealand as a Pacific nation, so wanted to highlight and adhere to Pacific values. That’s part of the reason they are offering up to half of the business to the public. And while Auckland has a vibrant dining scene, there was nothing highlighting a large portion of the population’s culture. It would also play a role in educating chefs on how to cook Pacific dishes, which is not often taught, as well as paying staff the living wage minimum ($19.80 per hour).